Can Chiropractic Improve Symptoms of Asthma? According to the Centers for Disease Control and Prevention, as of May 2018, 1 in 13 Americans have asthma, representing 26.5 million people. Of these 26.5 million, 6.1 million children and 20.4 million adults suffer from this chronic disease. 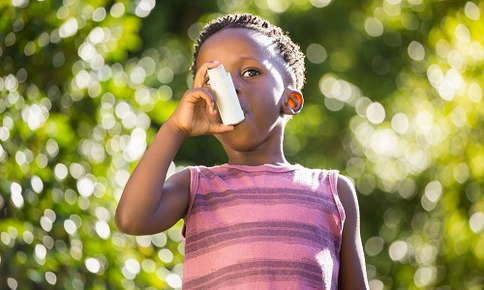 The annual costs of asthma to society are approximately $80 billion in the US alone This substantial amount includes medical expenses, missed school or work days, transportation expenses to medical appointments, and lost productivity. Effective clinical management of asthma continues to pose significant public health challenges to the patients and the U.S. healthcare delivery system. Standard treatment for asthma consists of a variety of medications. The gold standard of treatment is inhaled corticosteroids. Asthma inhalers are so much a part of daily life that they appear regularly as hand-held props in television programming and in film. In these shows, the difficulty of the moment for the character is acted out by having the player pull out her or his inhaler and take a quick puff. Additional standard medications include long-acting beta agonists, which open the airways, and leukotriene modifiers such as montelukast (Singular), which help to prevent wheezing and shortness of breath. Short-term relief during an asthma attack may be provided by rapid-acting bronchodilators such as albuterol (ProAir and Ventolin). The primary challenge of asthma is that it is a chronic condition. There is no real end-point of the disorder and there is no cure. For most people, asthma symptoms persist long-term and likely require life-long medication. As well, there are numerous side effects associated with medication usage. For example, side effects of leukotriene modifiers may include depression, hallucinations, and suicidal thinking. Use of long-acting beta antagonists may enhance the risk of a severe asthma attack. Side effects of albuterol may include headache, dizziness, nausea, and vomiting, and sleep problems. Importantly, regular chiropractic care is a key component of a comprehensive asthma management program. Chiropractic care detects and analyzes spinal joint dysfunction and associated nerve irritation and nerve interference that may contribute to the presence of asthma in a child or adult. As a chronic disorder, asthma has complex physiological causes and nerve interference may be a factor in the development of many, if not all, of these factors. Next, chiropractic care corrects spinal dysfunction, helping to restore more normal spinal biomechanics and directly address the sources of nerve interference. Over time, regular chiropractic care helps to reduce the physiological stressors that are implicated in the symptoms of asthma and helps both children and adults obtain greater levels of long-term health and well-being.